Over the last fifty years, there have been thousands of nonviolent movements for peace and justice that have made huge strides, and at the heart of every one of those movements stands the life, death and teachings of Rev. Dr. Martin Luther King, Jr., the global apostle of Gospel nonviolence. Because of his legendary work in the Civil Rights movement, Dr. King’s stand against systemic poverty, institutionalized racism, permanent war and nuclear weapons, and his steadfast insistence on Gospel nonviolence as the best methodological tool for political change and the bottom line for human decency, thousands of nonviolent movements have sprung to life around the world. Dr. King’s courageous life and life-giving death have born tremendous fruit around the world in new unparalleled breakthroughs for justice and peace. Yet few know this. Few understand it. Few realize the global debt we owe to Martin King. Few see the transformative power of global, bottom up, grassroots people-power movements of active nonviolence. Long ago, Jesus said, “Unless a seed falls to the ground and dies, it cannot bear good fruit.” Apparently, this is the way positive social change happens. When people give their lives in nonviolent movements for justice and peace, the spirit of nonviolence gets unleashed and becomes contagious. Anything can happen, even peace. From Jesus to Dr. King, those who give their lives in the nonviolent struggle for justice, disarmament and peace, even though they appear to fail, bear tremendous good fruit in the long haul. That’s the way nonviolent change happens. That’s the lesson of Martin Luther King, Jr. That’s the undertaking we’re all called to support. That’s the path ahead. I grew up in Washington, D.C. in the late 1960s, where my father was a leader of the National Press Club. Though I was a boy, I was extremely politicized. I understood the evils of the Vietnam War and the hope of the Civil Rights movement. When Dr. King was killed, and two months later, Robert Kennedy, I knew then and there, that the world had changed for the worse, that the powers that be had destroyed the best voices for hope and change. From then on, I saw a direct line from the U.S. killings of MLK and RFK to Nixon, Vietnam, Reagan, the Central American Wars, the Bushes, the wars in Iraq and Afghanistan and the blatant fascism of the Trump Administration, and with them, a new sick world of permanent war, systemic poverty and racism, nuclear weapons and environmental destruction. For years, I pondered the lives of Dr. King and Bobby Kennedy. In college, I felt that the best response I could make after their assassinations was to give my life to Jesus, become a priest and then, a public peacemaker. In the 1980s, I lived for a while in El Salvador, and worked in a refugee camp in the war zone, under the direction of the Jesuits who were later assassinated. During those difficult days, people around me spoke in hushed tones about Archbishop Romero, as if he were alive. They had a vibrant theology of resurrection, which inspired their steadfast commitment to justice and peace. They knew he lived on in them, and because of his courage, they too spoke out. Romero is now canonized as a saint, and its easy to see his power, but back then, even the mention of his name was risky. I have never heard anyone speak of Dr. King that way. No one speaks of the resurrection of Martin Luther King, Jr. Unlike the suffering people of El Salvador, we have no theology of resurrection. We do not yet understand how our saints and martyrs have risen and continue to inspire us to work for a new culture of peace and nonviolence. Yet that is the way resurrection works. Martin is alive and well and risen, and continues to inspire us to practice nonviolence, organize for justice and peace, and give our lives for God’s reign of peace. Over the past forty years, I have been involved full time in the global grassroots, bottom up, people power movements of nonviolence, inspired by Dr. King. Along the way, I have befriended many of Dr. King’s friends and colleagues—Coretta Scott King; Jim Lawson; Vincent Harding; John Lewis; Dorothy Cotton and Bernard Lafayette. All of them, along with thousands of others, have continued Dr. King’s work of teaching and promoting active nonviolence as our one last hope, as our last ditch effort, our best way out of the madness, the best methodology for positive social change, the way of the nonviolent Jesus. I think the time has come to claim Dr. King’s resurrection as the power beneath our active, creative, organized nonviolence, just as we claim the resurrection of the nonviolent Jesus as the basis for our very lives. When the nonviolent Jesus rose from the dead, he remained as gentle, loving, nonviolent and determined as ever. He was not bitter or angry, vengeful or retaliatory. He did not get mad at the disciples for abandoning him. Instead, he blessed them with his gift of peace, breathed the holy spirit upon them, and sent them forth to carry out his mission of active nonviolence into the culture of violence. In other words, the risen Jesus was the embodiment of peace and nonviolence. As I reflect on that, I conclude that resurrection means having nothing to do with death, which means having nothing to do with violence, which means, resurrection is all about nonviolence. If we want to get ready for resurrection, and follow the nonviolent Jesus, we practice resurrection by trying to be as nonviolent as possible—to ourselves, to every human being we meet, to every creature on earth, to Mother Earth, and through our participation in the local/global grassroots movements of nonviolence for justice and peace. That’s where we are today, on the break of global destruction with permanent war and systemic poverty and racism, nuclear weapons and catastrophic climate change, a whirlwind of global violence that infects every aspect of society, in every corner of the world. Dr. King’s core message was the wisdom and way of nonviolence. His daily call was a passionate plea for us to become people of creative nonviolence who work for a new nonviolent world without war, poverty, racism, sexism, nuclear weapons or environmental destruction, a whole new culture of nonviolence which he understood as the coming of the Kingdom of God on earth. He said we do this no matter what, that we keep going no matter what, that we struggle for justice and peace and never give up. From the Montgomery Bus Boycott through the Freedom Rides and the Birmingham Campaign to his March on Washington and Selma March through his organizing projects in Chicago and the Poor People’s Campaign and his public denunciation of the Vietnam War—Dr. King lived, breathed, taught and modeled Christian nonviolence. If we want to take Dr. King seriously, I suggest we start studying, teaching, practicing, organizing and renewing nonviolence in our lives and communities. The more we promote and practice nonviolence, the more Dr. King rises among us, just as Oscar Romero continues to rise in his people. As we go forward in these difficult times, we can let Dr. King rise in us, if we dare, by daring to rise to the occasion, and becoming the people of active nonviolence he hoped for. Let’s do it. 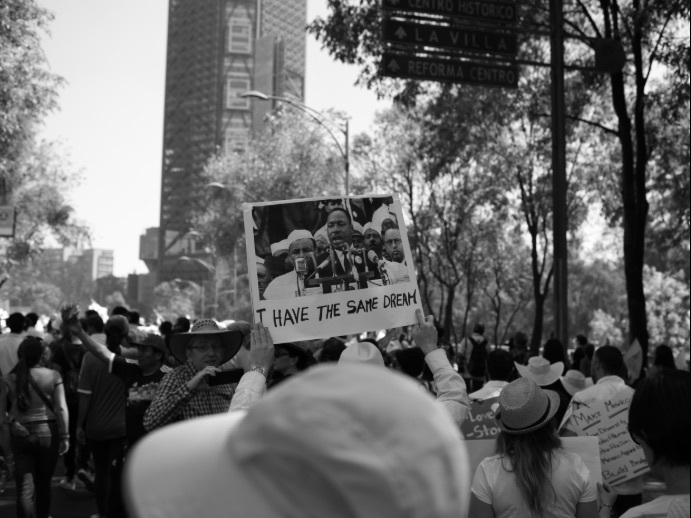 Last September, Pace e Bene organized our fifth national week of action, from Sept. 15-24, 2018, with over 2650 events, marches and actions across the USA, involving a hundred thousand people, speaking out for a new culture of nonviolence. We were trying to put nonviolence into action, to get the grassroots movement moving. On top of this, we gathered in Washington, D.C. at the Dr. King statue, and marched past the Lincoln Memorial to the White House for a vigil against war, racism, greed, nuclear weapons and environmental destruction. Ten of us committed civil disobedience, holding out signs right at the gates. It was daring, public, exciting, and meticulously nonviolent, for we walked in silence, in prayer, in peace, like Gandhian satyagrahis. We tried to step up to the plate and carry on the witness of Dr. King, in our own turbulent times, come what may. That’s not all. Our group, www.campaignnonviolence.org has called for cities around the nation to become “Nonviolent Cities,” where every aspect of civic society is nonviolent, so that people are not hungry or impoverished, there are no guns and killings, no violence or racism, that the schools teach nonviolence, the churches preach nonviolence, and the city councils and mayors work for a nonviolent society. We think this takes Dr. King to a new level. It can’t be measured, but it’s happening, and with this quiet grassroots organizing, Dr. King rises and so do we. On top of this, some friends and I have been working with the Vatican over the last few years to ask the Pope to write an encyclical on nonviolence. During our historic April 2016 conference on nonviolence at the Vatican, we took turns speaking about Jesus’ way of nonviolence and the need for the universal Church to advocate nonviolence. After the conference, Pope Francis wrote a world day of peace message calling for nonviolent alternatives to war and violence. It was the first statement on nonviolence in the history of the Church. What a sign of hope! Around the world, there are many signs of hope, signs of resurrection—the Black Lives Matter movement, the #MeToo movement, the Plowshares movement, the Parkland Students’ “March for our Lives,” resistance to the Trump administration, the International Campaign to Abolish Nuclear Weapons, the environmental movement, the anti-death penalty movement and so forth. In particular, I take heart because for the first time since the early days of the church, Christians are beginning to discover the nonviolence of Jesus and make it a central aspect of their own lives. That’s the path to resurrection, the way forward. We are not going to give up. We are going to keep practicing nonviolence, resisting systemic violence, speaking truth publicly and organizing the grassroots movements for positive social change. As we do, Dr. King rises among us, as does Jesus, and we experience the breakthroughs of God’s reign in our midst. Hope indeed!